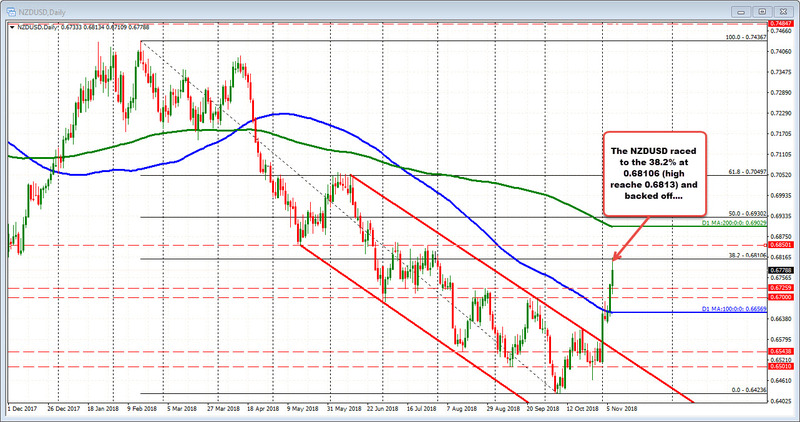 The NZDUSD ran up on the RBNZ headlines. They moved up the tightening 1 quarter to the 2Q of 2020 (from the 3Q). The price action moved to a high of 0.68134. That was just above the 38.2% of the 2018 trading range at 0.68106. The 38.2% is the minimum target for the bulls. That was hit. The price has backed off and trades at 0.6780 currently. Sellers were waiting right at the target level. Drilling to the 5-minute chart, the price raced higher and as fast as it went up, it fell back down. In the process, the pair moved back to the 200 bar MA on 5-minute chart at 0.67754 and stalled. A move below that MA would give profit takes/sellers more of a reason to try the short side.